Benefits of BeauWorld Nano Steaming include up to 10x improved blood circulation. Improves cell vitality and oxygen absorption through skin for a healthier younger looking complexion, significantly improves absorption of your beauty creams for increased effectiveness and promotes drainage of sinuses and airways for overall improved well-being. Enjoy relaxing, spa-quality facials at home with this BeauWorld Nano Facial Steamer, a perfect skin care tool to fully moisturize your skin and thoroughly cleanse your face. 1-Penetrate the skin barrier more that normal steamer: BeauWorld Nano-ionic steam can penetrate the skin barrier more easily. A tepid and gentle temperature of the steamer can unclog pores, remove dirt, oil, keratin and leftovers of makeup, providing a quick nutritional-absorption for your skin. 2-Make nutrients more absorbable for the skin: It can melt away dead skin cells to make nutrients more absorbable for the skin. After a period for using, the symptoms of blackheads, fat granule and acne can be relieved significantly. 3-Promote collagen regeneration: The steamer activates the hydrophilic factor and replenishes water in your skin to promote collagen regeneration, it can soften the cuticle, restore smooth, delicate skin and improve skin's nutritional absorbency. Also it can weaken pigmented spots, kill skin bacteria, and suppress acne. 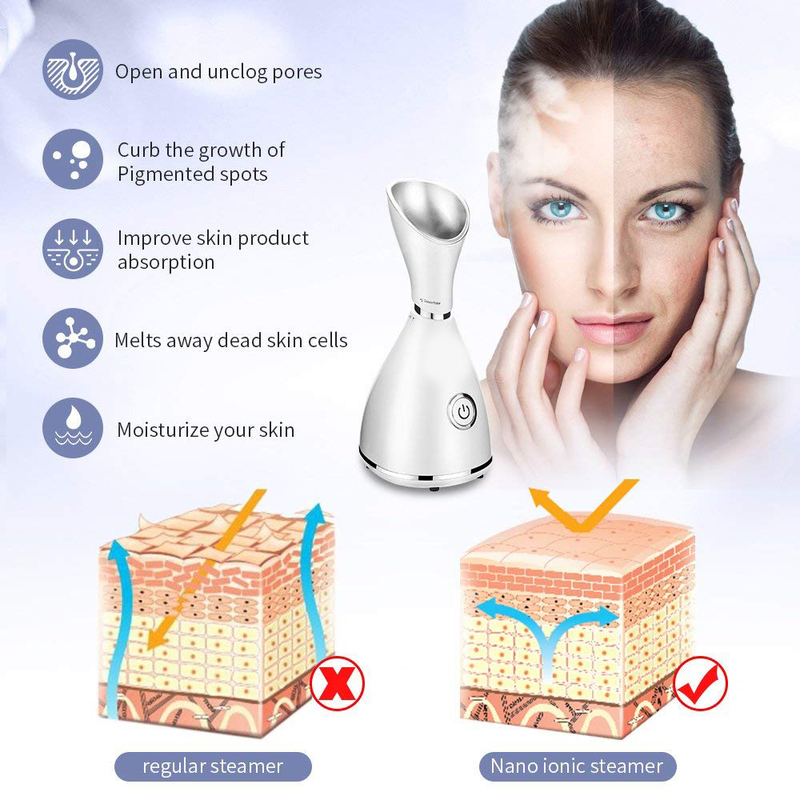 -Powerful & Consistent Facials Steamer: Compared to normal face steamer, BeauWorld Nano ionic steam can penetrate the skin barrier and open pores more effectively. A tepid and gentle mist can unclog pores, remove dirt, oil, blackheads and leftovers of makeup, providing a quick nutritional-absorption for your skin. -Quickest start: steam time setting salon spa beauty equipment generates full-powered steam in under 30 seconds. Advanced ultrasonic atomizer silently effectively turns clean water into micro-fine particles to produce a powerful, consistent mist to open & unclog pores, remove skin dirt, oil & makeup. Also it can melts away dead skin cells to make toner, cream and other nutrients easier to be absorbed. BeauWorld Nano ionic face steamer provides you elastic rosy cheeks. 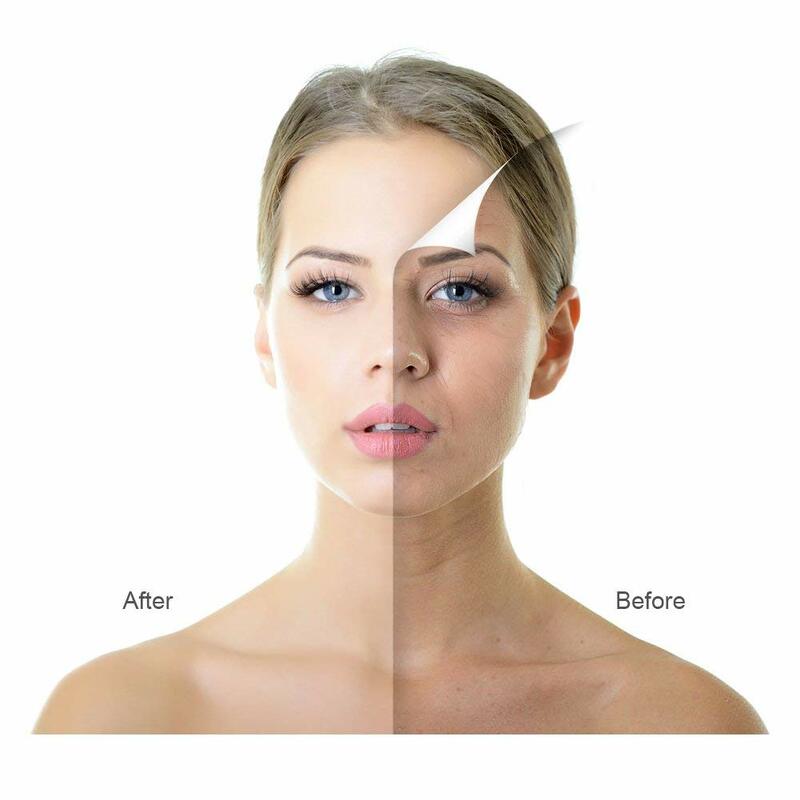 -Healthy Skin Care: Deep skin cleansing for facial treatment to remove skin dirt, oil and makeup, kills the skin bacteria and melts away dead skin cells. It can highly hydrate for facial skin to improve cell vitality and nutritional-absorption to help skin restore to a smooth, delicate skin condition. -Easy to Use: Press the water tank cover gently, it will pop up automatically. Add some water (Only use the distilled water or purified water) into it and connect it to the power. One touch button for easy operation, working with indicator light. One simple push generates superfine steam particles to penetrate deep into skin and moisturize your face. A soothing stream of hot mist quickly opens up your pores, to completely remove makeup, dirt and other impurities from skin. You can steam before skincare routine to help absorb lotion and cream better; steam in the morning to soften your skin for easier makeup application and longer lasting results. Facial steamer utilize ultra-fine Nano-sized particles penetrate the skin and effectively supplement moisture. The advanced PTC ceramic heating element to vaporize distilled water and produce a visibly strong steam instantly. The BeauWorld Nano steam combined with ionic water particles are up to 10x more effective in penetrating skin. So just enjoy your spa facial treatment at home! The BeauWorld Nano Ionic Facial Steamer can moisturize skin and deeply cleanse pores. The facial atomizer takes personal sauna spa quality skin care with high quality facial hydration system. The BeauWorld Facial Steamer takes the advanced PTC ceramic heating element to vaporize clean water and produce a visibly strong steam instantly. Ample and directed micro-fine steams penetrate deeply into all your skin layers. BeauWorld Nano steam combined with ionic water particles can be up to 10x more effective in penetrating skin. 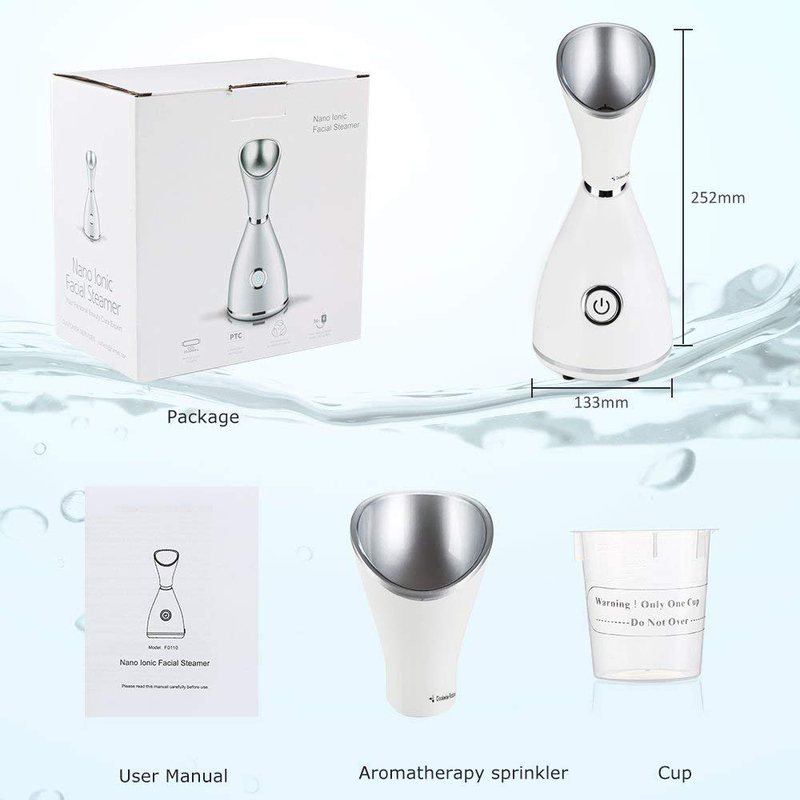 Facial steamer is a new BeauWorld Nano-ionic steamer that combining a conventional heating element with a new ultra sonic vaporizer to produce Nano steam with negatively charged ionic particles. BeauWorld Nano steam combined with ionic water particles are up to 10x more effective in penetrating skin. 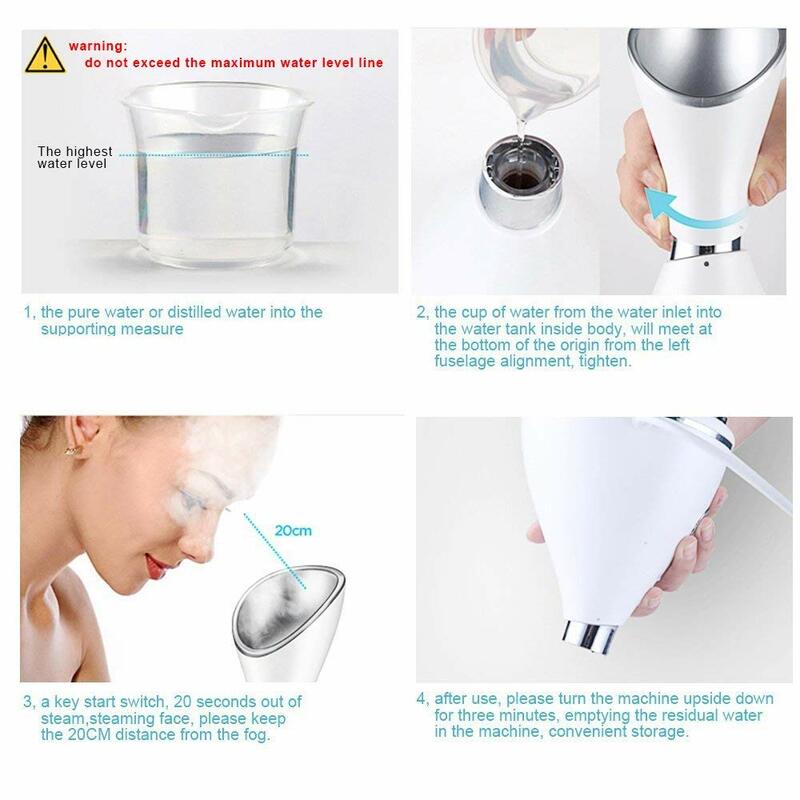 Full face steamer for intensive skincare and inhalation attachment for nose and mouth inhalation to clears your blocked nose, humidifier function. Suitable for all type skin -A relaxing stream of warm mist covers your whole face with its finely tuned nozzle, quickly opening up pores to thoroughly remove makeup, dirt and other impurities from skin. Guaranteed Effects: BeauWorld Nano ionic facial steamer generates 4000 times superfine steam particles. Warm mist with 10X effectively moisturizing covers your whole face, improves cell vitality and oxygen absorption through skin for a healthier younger looking complexion. Suitable Running Time: The unit is ready to be used and releases steam after only 30 seconds after being turned on. About 8-10 minutes of working time are enough to easily unclog pores and remove blackheads, makeup and dirt. Home Sauna: Enjoy relaxing quality facial Spa at home. Before using facial mask, applying facial steamer to unclog pores and enhance the skin's absorption of the nutrients from the mask. 1.Softens surfaces skin to help remove dead skin, dirt, oil and makeup remnant. it can weaken pigmented spots, kill skin bacteria, and suppress acne. 6-Penetrate the skin barrier more that normal steamer: BeauWorld Nano-ionic steam can penetrate the skin barrier more easily. 7-Make nutrients more absorbable for the skin: It can melt away dead skin cells to make nutrients more absorbable for the skin. 1. Before steaming at face for the first time, please let the steamer run through a full cycle with a few drops of lemon juice added into water to remove smell. 3.When finished, please wait 3 minutes for the steamer to cool down before pouring out remaining water. How to use the Nano Facial Steamer?